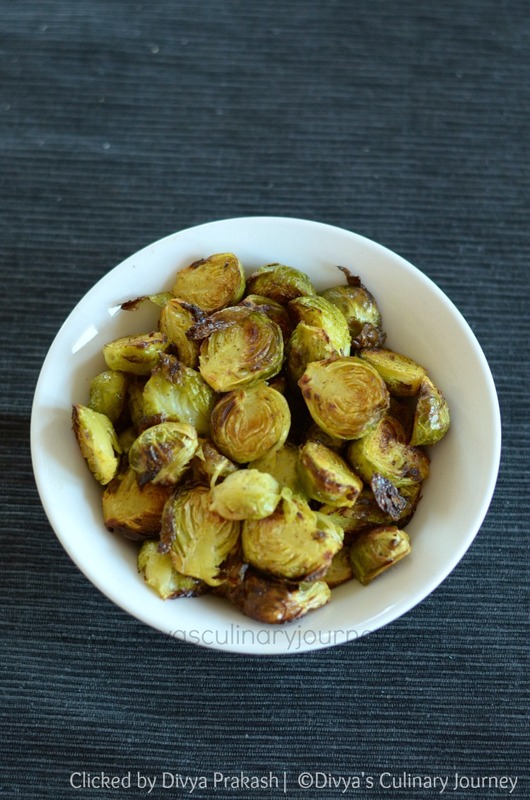 Today I am going to share a simple recipe for Oven Roasted Brussel sprouts. This week Hubby got brussel sprouts fresh from the market, on the way back home from work. I must admit that I am not much familiar with this vegetable. My daughter calls them "baby cabbage" because they look like miniature cabbages. I have prepared this once before and decided to cook these in the same way too- Oven roast them. I tossed them with few ingredients and roasted them in oven and they are ready. We had it just like that as you would eat french fries. They tasted best when they were warm. How to make roasted brussel sprouts in oven? Wash, clean and cut brussel sprouts into 2 halves. If they are big you can quarter them. Mix olive oil, salt, chopped garlic, ground cumin, turmeric powder and ground pepper. Add brussel sprouts into this mixture and toss them well. Pre heat the oven to 400F. Line the baking tray with aluminium foil. Transfer the brussel sprouts to the baking tray and roast in the oven for 10 minutes. Then flip them to the other side and bake for another 10 minutes till they are browned on the edges. Instead of ground pepper you can add red chilli powder too. Instead of adding just garlic you can add ginger garlic paste too. Oven timing may vary with each oven. Brussel sprouts have to be slightly browned on the sides and have to be completely cooked through. Otherwise flip them one more time and bake for few extra minutes. I also noticed this requires more salt than for the usual cooking. So check and then adjust the salt as per your taste. Thangam Sounds crispy will go well with dhal rice I believe. Roasting is my favorite way to prepare brussels sprouts. Looks great! I love the spices you used here - sounds so delicious! On my must-try list! We adore roasted Brussels sprouts and your recipe sounds delicious! Turmeric is a super strong anti-inflammatory. I try to use it some way everyday. Happy to see it used with delish Brussels. Great spice combo. On my "to do" list. 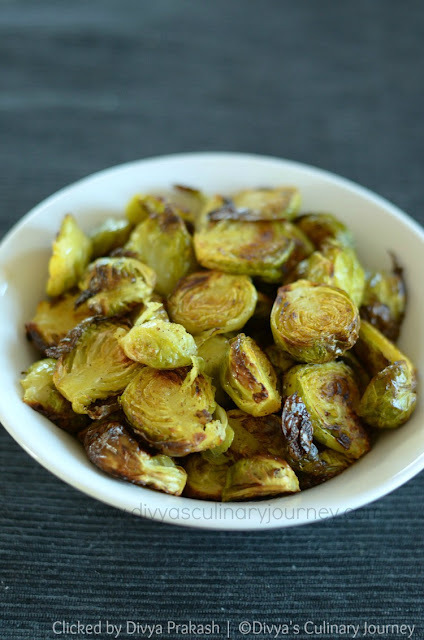 Brussel sprouts are such a big hit with me, love the idea that they're oven roasted. U seriously love Brussels sprouts, I can't wait to try these! This is exactly how i love to eat Brussels Sprouts, great recipe! I love Brussels Sprouts, and need to make them more often. This is such a great recipe. Thanks! I never used to like Brussels sprouts but I have grown now to enjoy them especially when roasted!! 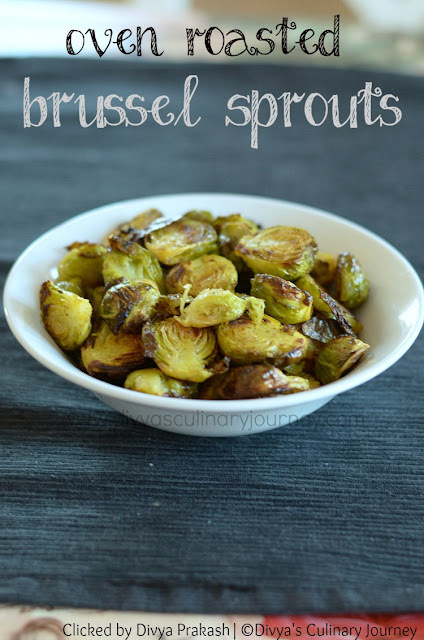 This sounds like a delicious way to prepare brussel sprouts! 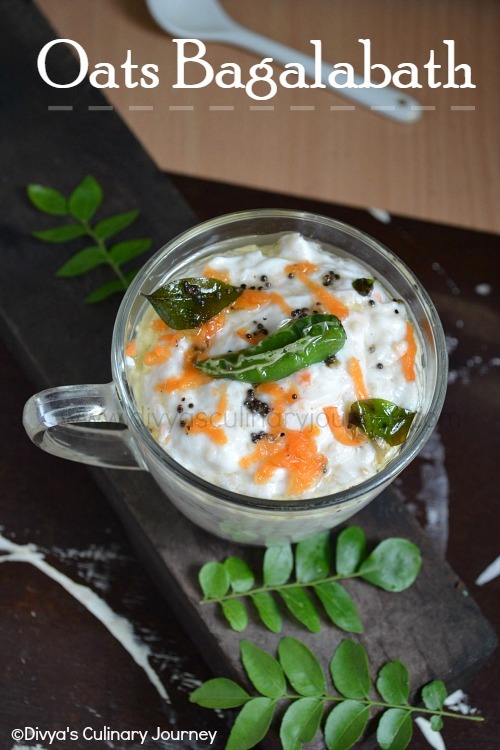 Lovely idea to use cumin and turmeric!